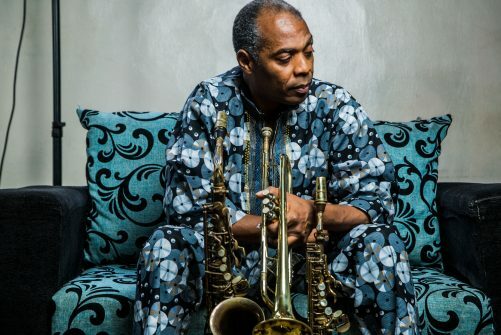 The superstar of afrobeat, Femi Kuti, returns for a UK tour. Kuti is the eldest son of afrobeat pioneer Fela Kuti, and a grandchild of a political campaigner, women’s rights activist and traditional aristocrat Funmilayo Ransome Kuti. Born in London but growing up in Lagos, Nigeria, Femi’s musical career started at just 15 when he began playing in his father’s band, the legendary Egypt 80 in 1979. This upbringing had a profound effect on the young Femi and 1986 he started his own band, Positive Force, joined by his sisters Yeni and Sola (as the lead dancers), establishing himself as an artist independent of his father’s massive legacy. His first record was released in 1989, ‘No Cause for Alarm’, followed by ‘MYOB’ in 1991. Four years later he released his self-titled LP through Tabu/ Motown, and in 1998 released the seminal ‘Shoki Shoki’ which garnered widespread international critical acclaim. In 2000 he opened his own club, The Shrine, where he recorded the live album ‘Africa Shrine’ and later that year won a Monaco World Music Award. He went on to collaborate with the likes of Common and Mos Def on ‘Fight to Win’ and toured the USA with Jane’s Addiction, and after a four year hiatus re-emerged in 2008 with ‘Day by Day’ and ‘Africa for Africa’ in 2010, receiving two Grammy nominations. In 2012 he was inducted into the Headies Hall of Fame (the most prestigious music awards in Nigeria), was the opening act on the Red Hot Chili Peppers’ European tour, and became an Ambassador for Amnesty International. He continued to expand the diversity of his artistry on his 2013 his album ‘No Place for My Dream’ which also received a Grammy nomination, and like his father, Femi has shown a strong commitment to social and political causes throughout his career. His latest album, ‘One People One World’ was released in February 2018.